Learn how to use your camera, not how to shoot. That's the ethos at EOS Training Academy. They believe that knowing how your Canon EOS camera works and how to set it up to capture the image as you see it will improve your photography. Whatever your level and experience, you'll find a course to suit you. If you have just got your first EOS camera, they’ll get you started by explaining the basics and moving you off Full Auto mode. If you’re already comfortable with your camera and want to fine-tune your skills, then you’ll find some of the more challenging and creative courses right up your street. 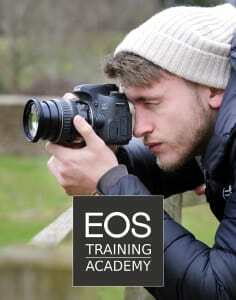 The comprehensive programme of courses has been developed over the last ten years and is constantly evolving to meet the needs of photographers and the changes in camera development. The programme is split into two halves – workshops which are classroom-based events and more theory-led, and practical days which are predominantly hands-on learning. You'll always be in a small group so you can spend individual time with your tutor whilst also benefitting from the ideas and experience of fellow Canon photographers at a similar level to you. EOS Training Academy's lecturing team is rather special. Unique in fact. Each tutor has a long and distinguished background at Canon, as well as being experienced photographers in their own right. Yet these four Canonites would all agree that they’re educators first, photographers second. That’s because they’re passionate about sharing their intimate knowledge and in-depth understanding of the Canon EOS system with you. And this is achieved via the carefully structured training programme held year-round, where our combined camera knowledge and photographic experience is shared with you, without limits. Very theoretical with a bit of practice at the end. Really good take home resources. A great day if you haven't got a Scooby-Doo about technical terms, and what each does - definitely showed me what my camera can do! Brian also provided lunch, cherry bakewells and tea and coffee throughout the day which was a nice touch!